Why sling angry feathered friends mindlessly across the screen? I created this game to add an educational and problem solving spin to it. 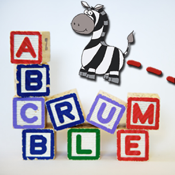 ABCrumble is fun and educational. Helps in logical thinking and sharpens problem solving skills. Made for kids in Primary School. Best for Ages 6-12.